The Bride Quartet resonated with so many readers for a variety of reasons, mainly for how four women pooled their talents and friendship into a business meant to make wedding dreams come true. To all the wedding suppliers, coordinators, florists, photographers and bakers out there – our hats are off to you! The bywords of a wedding day for the behind-the-scene planners is organization and stamina. And I say this with all the admiration and respect in the world. Two years ago, Nora, her son Jason, daughter-in-law Kat, our good friend Sarah and I teamed up with some fabulous contractors to help create a picture perfect wedding for Nora’s older son Dan at Inn BoonsBoro. 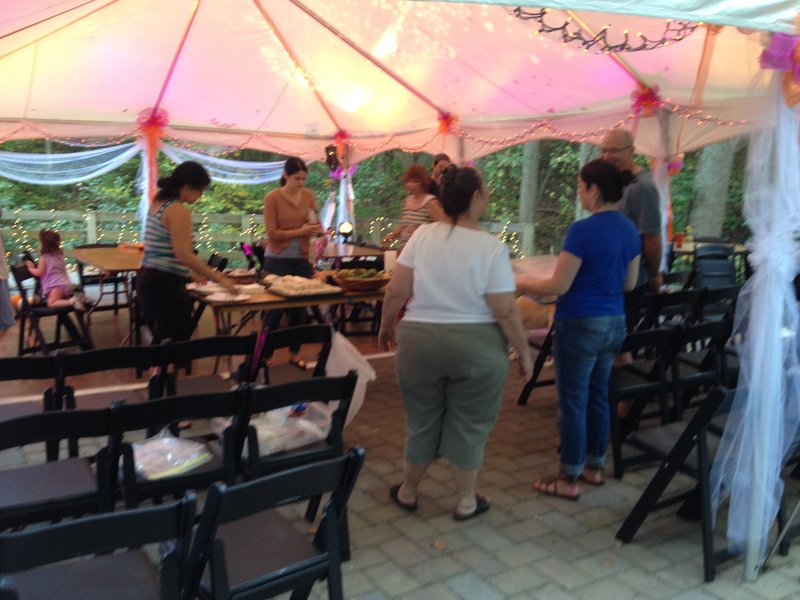 Last Saturday, the team was back in action, this time for a backyard wedding for Sarah and her new husband Jack. And it was a lovely family affair. Nora and Bruce hosted the ceremony and reception up at their house. Nora worked with Sarah on the flowers; Jason handled the layout, tent, lighting and sound design; Kat hand-crafted the invitations, made candles, made bows, decorated the tent and came up with so many small touches to make the day lovely. In the larger scheme of things, I had a small role – officiating the ceremony and doing the bride’s makeup. Since there were no expectations of an impossible perfection, the day — the whole weekend — just ended up being perfect for them. Set-up was scheduled for the Thursday and Friday. The tent arrived early Thursday morning and Kat set about hanging tulle, fairy lights and the first of her ribbons and bows inside the perimeter. Sarah washed all the pumpkins and Nora tied fabric ribbons around the stems. 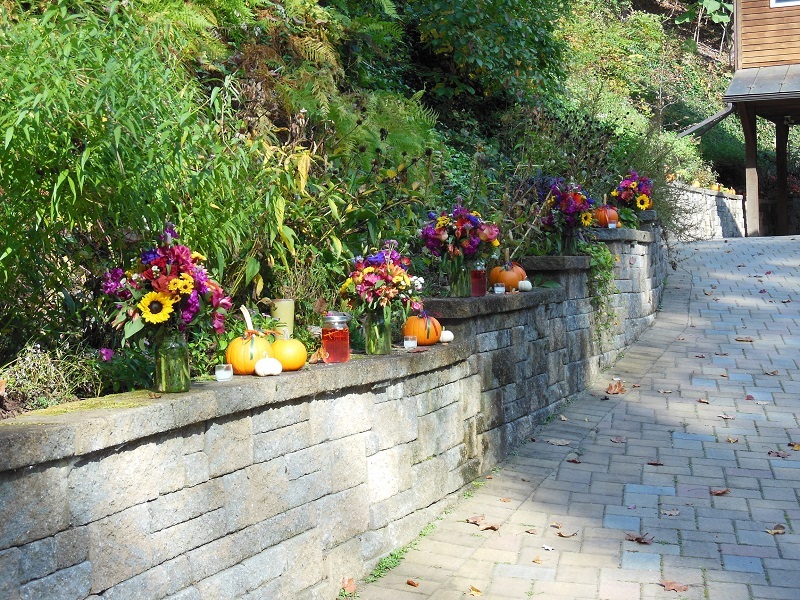 The pumpkins lined the driveway wall, candles (mason jars filled the water/food color, olive oil and wicks) were added on Friday and flowers were added on Saturday. Here’s the completed look. Thursday night was about Kat making bows from her bag of every single orange and hot pink ribbon in all the land. The rest of us drank some champagne while watching in awe. Friday morning Kat and Sarah had mani/pedis, Nora (who was getting over a bad, post September signing illness) worked out and then got the house and the yard ready for the rehearsal dinner. Jason began hooking up the lights and the sound system, while I finished up writing the ceremony. By 5 pm, the lights were pretty much done to Jason’s satisfaction, the father of the bride was tying more ribbons and my daughter was enlisted to do the same. Here’s everyone at work. After some get-to-know-you time, we had two rehearsals. Homer (Nora and Bruce’s older yellow lab) decided the best place for him was lying in the aisle so Sarah had to step over him both times (I was afraid she would impale him since she rehearsed in her wedding shoes). Pancho had a ball. He dropped it whenever he could. Here’s a glimpse of Homer and Pancho doing their thing on Saturday morning. 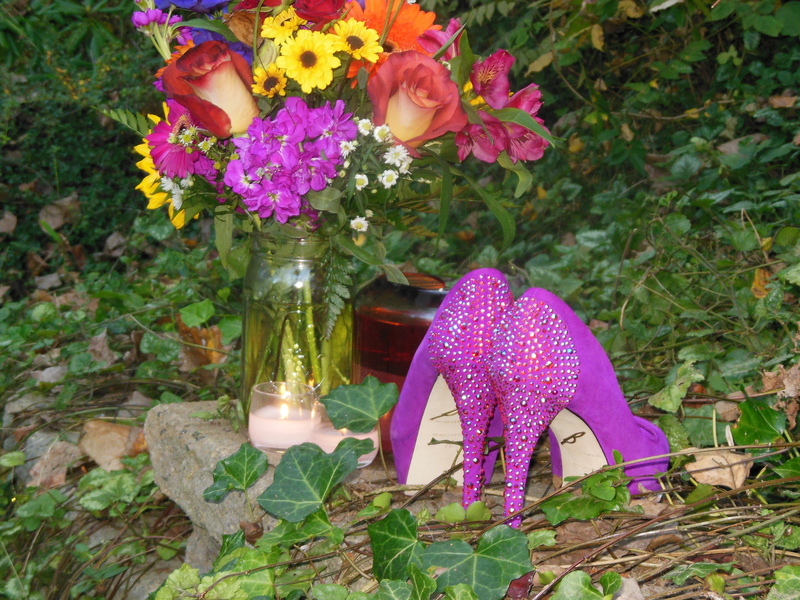 And here are the wedding shoes – the reason why I was afraid she’d impale Homer — B Brian Atwood ‘Baccina‘. We had a nice dinner under the tent, simple food and lots of relaxed conversation as the day drifted into night. Here’s what the tent, set up for the ceremony, looked like in the early evening. Saturday morning dawned early. I took Sarah to get her hair done, while Nora, Kat and Jason worked with the florists, put linens on the tables and finished the many small tasks left before the 2 pm ceremony. By the time we got to Nora’s house, the florists were just about finishing up. Sarah had chosen hot pink and orange as her colors and Kat’s brilliance showed them to their best advantage. The bride remained calm throughout the day. We’d done a trial run of the makeup on Friday so it went smoothly on Saturday. 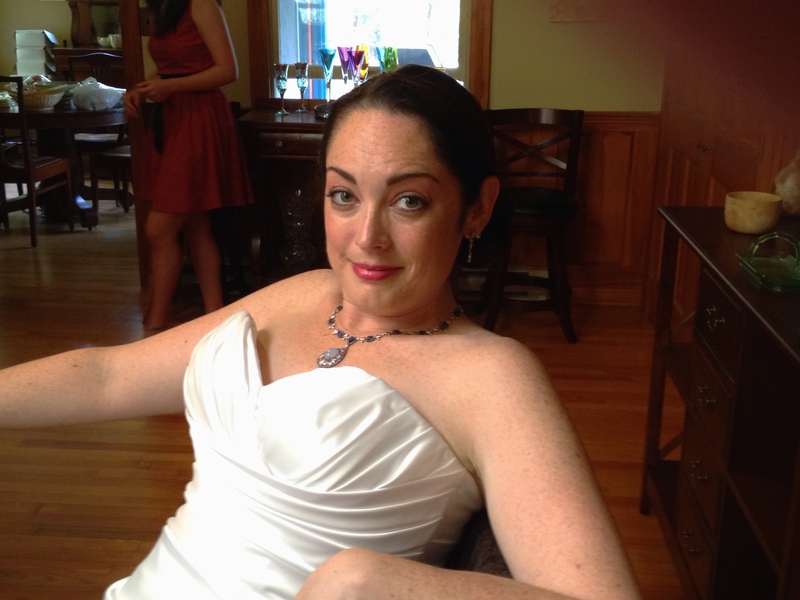 Here’s how she looked 30 minutes before the ceremony, even with a minor crisis when Nora helped her into the dress which no longer had an eye for the hook above the zipper. The bridal shop had forgotten it after some final alteration, but Nora and Kat solved the crisis within minutes. Photos were pre-wedding so the bride and groom could move quickly to the party – and to respect that Sarah’s soon-to-be stepson is four and that early photos would be best. By the time the ceremony started, we were all more than ready to celebrate the new family. We kept it to a sweet minimum, vows for the bride and groom, rings for each and then a small ceremony with the groom’s son, LJ, in which they all promised to be good to each other as they formed a new team, then Sarah put a Green Lantern ring on LJ’s finger. A quick benediction and then one hell of a kiss were all that were left before I introduced the couple and son. We danced and hung out as the sun went down on a truly lovely day. When it was time for the town car service in Houston Texas to drive our lovely newly weds home, everyone was in a blissful mood. The only thing we didn’t cover were photos of the team. As soon as I get some from Sarah, I’ll post them as well. Hi Laura! Thanks so much for sharing such a lovely time, it looked great! Kudos to the bride for her color choices, really eye-catching. When you said “Nora (who was getting over a bad, post September signing illness)”, I take it she caught a cold from one of her many fans? As someone with an autoimmune disease, I can commiserate and recommend she keep – discretely, of course – a bottle of hand disinfectant with her at the signings. I have little bottles of it wherever I happen to be and am convinced it helps keep me healthy. Looking forward to the rest of the photos, everything looked so beautiful – thanks! What a terrific wedding and sharing it with us, Nora’s fans, just extends all the good wishes coming the new little family way! I had always hoped that if I had remarried, I would have chosen a classic dress and killer pair of pumps! I’m so very glad this bride did; never expect the humdrum from her, or her approach to marriage. Please convey good wishes to all. NYC is still enjoying glorious Fall weather. A blazer or suit jacket is more than enough to wear. Halloween decorations are rampant throughout the 5 boros, while we gear up for Thanksgiving, the Macy’s Parade, then Christmas. I too am finished my shopping. Best wishes to all of of the clan, from a loyal fan! How lovely! Love the colors. Feel better to Nora. Thanks for sharing. Looks like a sweet wedding 🙂 Good job to everyone who helped set up, it looks great! What a beautiful wedding! LOVE the color choices, especially the killer shoes! Thanks for sharing the day with us. Hope Nora is feeling *much* better very, very soon! I just finished listening to the audio version of the Wedding Quartet (I’d already read the books) and I think I may start again! So fun to see this post just when I finish! Sounds, and looks, like a lovely day. What a lucky couple to have all of you for friends!! Took me back to my youngest sister’s wedding. It was held on the family farm and family and friends pitched in and everyone was involved. What wonderful family memories we have. – as will this new family. Thanks for sharing. 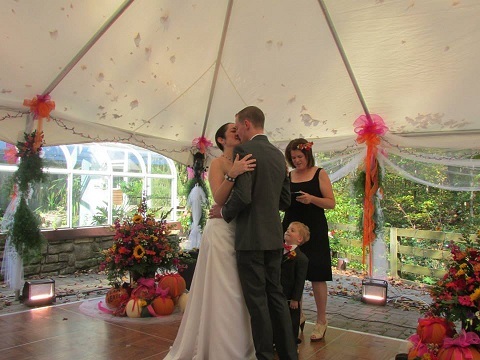 Beautiful colors and bride – perfect day:) Thanks for sharing – love to see pictures from Boonsboro. Wonderfully set with lots of good taste details and more important in observance to what the couple and their son needed and wanted. Wonderful Job! I would never have thought of using those 2 colors together but it looks awesome!! 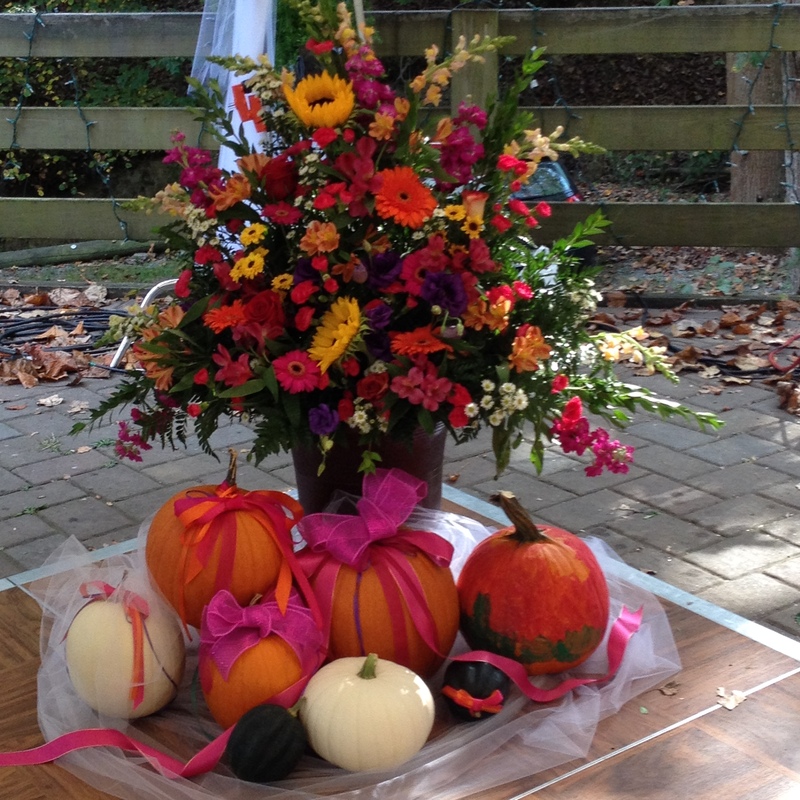 I love the flowers and pumpkins…Beautiful job! Get Well soon Nora!!!!! It is wonderful, I liked the flowers, I liked the colors, I liked all but I found so, so sweet, ‘as happening in the Nora’s book’ Sarah put “a Green Lantern ring on LJ’s finger”. I wish a wonderful and happy live to the newly married and new family. Here in Brazil ‘The Bride Quartet’ is coming, now in November. We are so HAPPY!!!! Looks and sounds as if everyone had a grand time. Thanks for sharing. Happy wedding, Sarah!! Looking forward to congratulating you next time I see you in person! Best wishes to the bride and groom. Everything looks great. Those invitations are beautiful. Thanks for sharing. What a beautiful wedding. Thank you for sharing it with us. I loved the color combination it looks fabulous as do all the pictures. Have a great holiday season, it’s sneaking in the door. Hope Nora’s felling better soon. She’s the kindest, sweetest person along with giving and sharing. 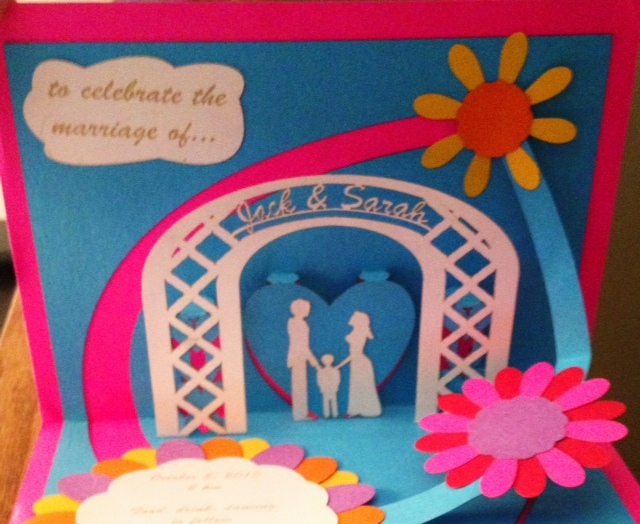 Congratulations to the Wedding Family! What a lovely day it must have been…and wow, the orange and hot pink really work. Beautiful and cheery.